Yesterday, in his own city of Genoa, Father Andrea Gallo died at the age of 84. A “street priest”, as he liked to be called, he was much loved by the Catholic and non-religious left for his political and social commitment. 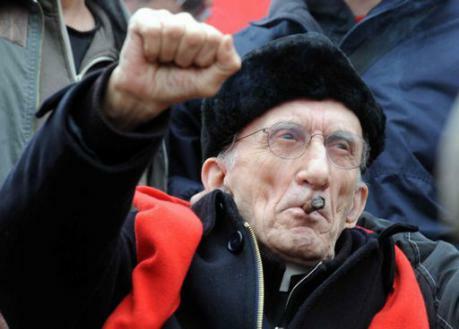 In his city, Don Gallo came to attention at the end of the 70s when he was removed from his parish for public speeches which were, according to the cardinal responsible for the removal, “not Christian but communist”. The straw which broke the camel’s back, apparently, was a sermon in which Don Gallo accused of hypocrisy those who were outraged by young people smoking cannabis whilst at the same time defending classism and wars. His removal sparked big protests in his parish which had become a reference point for poor and marginalised people. But the Church’s governing Curia did not change its mind and so from then on Don Gallo would never again be assigned a parish. He was amongst the founders of the Community of St Benedict at the Port of Genoa, a shelter for drug addicts and people with mental illness and a benchmark for the whole city of Genoa. He was a close friend of Fabrizio de André, a singer whose songs told of the streets of Genoa, filled with hookers, poor people, foreigners and the marginalised. And in the same streets Don Gallo was a deeply loved figure. Defender of the right to abortion, a fervent anti-racist and anti-fascist, he declared that homosexuality was a “gift of God”, and supported gay people’s right to marry and adopt children. He attacked the interference of the Catholic Church in the political, social and economic life of the Italian State, and was a harsh critic of its backwardness concerning the family and sexuality. A tireless orator and a constant presence at demonstrations, whether strikes, No Tav demos, Gay Pride marches and social forums, he saw Genoa devastated by the police force during the G8 meeting in 2001. He never gave up seeking justice for Carlo Giuliani and for those who suffered torture and repressive violence. He was close to SEL (Sinistra e Libertà), Nichi Vendola’s party, and supported it during national elections and the municipal election – when SEL’s candidate Marco Doria was elected as mayor. This brought him much criticism from the left. But all the same, today everyone is mourning the death of a comrade. More sources and information are here.